This week’s W.Y.O.S.T. 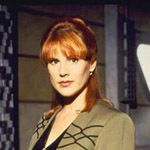 subject is Patricia Tallman. She popped into my head last week, because she was the co-lead alongside Tony Todd in George Romero’s 1990 remake of Night of the Living Dead, in which she played a considerably updated version of the Barbara character. No longer meek and vulnerable and seemingly catatonic, Tallman’s zombie-killing version of Barbara was an appealing change of pace — a tough 90s echo of Ripley from Aliens and a pre-cursor to Whedon’s Buffy the Vampire Slayer. But it wasn’t until I did an IMDB search that I realized I knew this redheaded actress from some other projects as well. 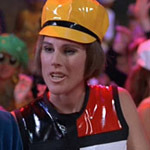 Patricia Tallman started her acting career on the stage, and didn’t arrive on the Hollywood scene until she landed a role in George Romero’s 1981 movie Knightriders (don’t worry, I’d never heard of it either). The film didn’t do well either critically or at the box office, but it kicked off an ongoing working relationship with Romero and with makeup legend Tom Savini. 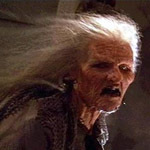 Over the next decade, she’d work with one or both of the two in various movies and TV shows, including Tales from the Darkside, Creepshow 2, Monkey Shines, and of course, Night of the Living Dead — sometimes as an actress, and sometimes as a stunt woman. In fact, about half of the items on Tallman’s resume are stunt work rather than, or in conjunction with, acting work. It was a steady source of income that she stumbled across (pun intended) early on in her career, while doing soap opera work on One Life to Live. An athletic and fearless individual, she apparently enjoyed the change of pace — and particularly the pay checks — that stunt work afforded her. 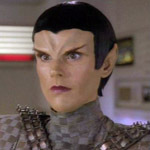 Over the years, she has “doubled” for Tina Louise, Joan Severance, Laura Dern, Daryl Hannah, Geena Davis, and Hudson Leick, to name a few, as well as quite a few actresses on the various Star Trek shows. 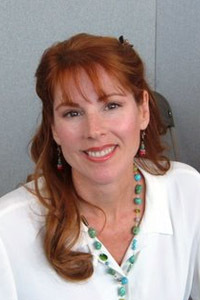 After Night of the Living Dead, Tallman found a few movie roles — as the Possessed Witch in Sam Raimi’s 1992 Evil Dead sequel Army of Darkness, as an “Electric Psychedelic Pussycat Swingers Club Waitress” in the 1997 Austin Powers movie, and as the lead alongside Claudia Christian in the 2001 sci-fi detective thriller Never Die Twice. 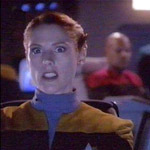 But much of her acting work in the 90s and beyond has been one-shot television roles on shows like The Flash, Dark Skies, Sheena, Without a Trace, and several of the Star Trek shows — The Next Generation (3 roles), Deep Space Nine (3 roles), and Voyager (1role). 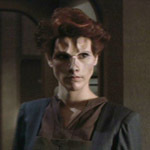 But the distinctive redhead is perhaps best known to sci-fi fans as Lyta Alexander, the most powerful telepath in the Babylon 5 series, where she appeared in the pilot, as a recurring character in Seasons 2 & 3, was a regular cast member from Season 4 onward, and even appeared in the post-series movie, Thirdspace. Most recently, Tallman appeared in InAlienable, a movie penned by Walter Koenig (Star Trek‘s Pavel Chekhov), alongside a host of other Star Trek and sci-fi alums, including Richard Hatch (of Battlestar Galactica, not Survivor), Marina Sirtis, Alan Ruck, Richard Herd, Gary Graham, and J.G. Hertzler. When she’s not acting or raising her son, Julian, she dedicates her time to Penny Lane, a center for abused children in California. She also co-founded and maintains The Galactic Gateway, a sci-fi community web portal. And she’s fan-friendly, so be sure to seek her out on the convention circuit!